We are pleased to welcome our newest commercial pilot, John Dee Shapland. After flying in Dubai for the last two ballooning seasons and with a wealth of over 20 years of being a hot air balloon pilot we are proud to welcome him to the team. Dee Shapland will be flying in the Cornwall and Devon area to ease the workload for the other pilot’s in these areas. 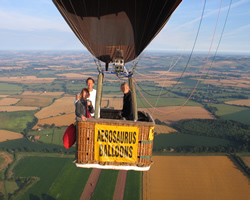 To mark the event he flew an hour and a half private balloon flight over Exeter and Cullompton this morning.